Wrinkles is a therapy dog and lonely at the moment because she’s not working. She decides to go to the puppy store and ‘orders’ some puppies to train to also be therapy dogs. Some of the puppy parts get mixed up and one of the pups has green ears! Although different from the rest of the pups, the puppy with the green ears attracts a special friend. This tale of fitting in and helping others will show children that being different is not so bad after all. 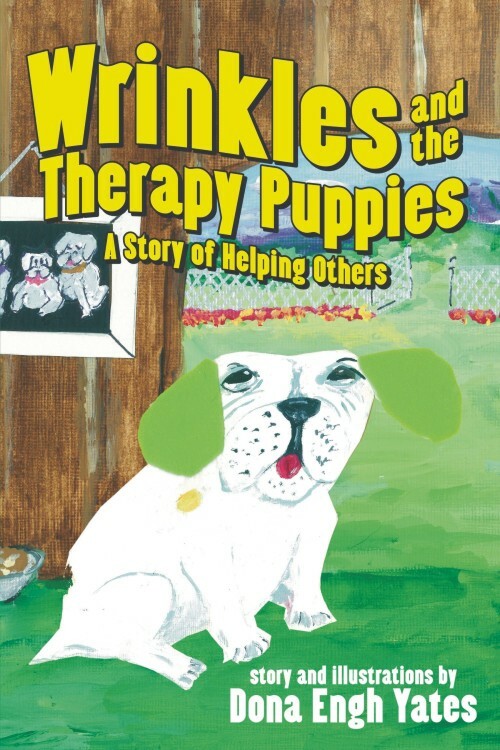 First-time author, Dona Engh Yates, works with therapy dogs and pens a charming children’s tale about helping others. Included are facts about therapy dogs and the wonderful work they do to help Veterans, the elderly, handicapped people and children with special needs. Excellent book to start a discussion and research on these very special canine companions to those in need.